The morning’s cold air hit us by surprise. 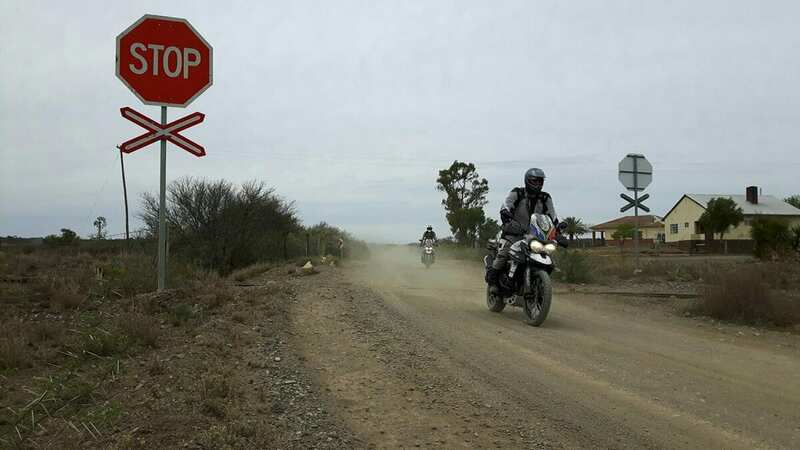 We’d been spoilt up until this stage by a warmth that was verging on unpleasant, but that wasn’t the case on day four as we made our way out of the quaint town of Colesberg. 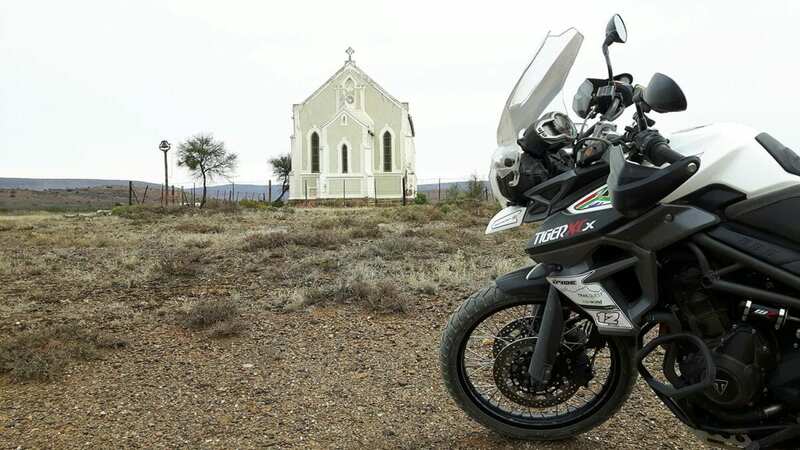 Our Tigers were equipped with heated grips and they proved a popular addition throughout our group of twelve bikes as we hit the highway and found ourselves deep within the Karoo. Without really appreciating the transition, the landscape had changed from being rich green farming pastures to rocky scrub land; similar to what you’d find in the south of Spain. Likewise, the cows and general livestock in those fields had morphed into creatures a little more exotic. Within a matter of miles, springbok, snakes, blue cranes and baboons had caught my eye. And then there were the vervet monkeys which numbered in their hundreds, littering the side of the road. As an outsider, goggling at these creatures made it hard to concentrate on the route ahead, which had also changed from the mind numbing endless straights we’d become accustom to. Now we were faced with bends! Better still, the bends lead us up into mountainous terrain, with the day’s highlight being our crossing of the Lootberg Pass. It came as a bit of a surprise, but I wasn’t complaining as I powered the Triumph higher and higher up the towering mass of rock. The view of the plain below was breath taking, and the fast sweeping bends of the descent were a real treat to ride. Having lunched on kudu pie (a game antelope), the afternoon saw us hit the first dirt trail of the day. We had around 75km of the rough stuff to contend with, and it once again proved a good challenge for the whole group. Despite being regularly graded, these trails are littered with potholes, loose stones and often piles of sand. On top of this, you’ve got to contend with the dust clouds which really limit visibility like the thickest of fog. 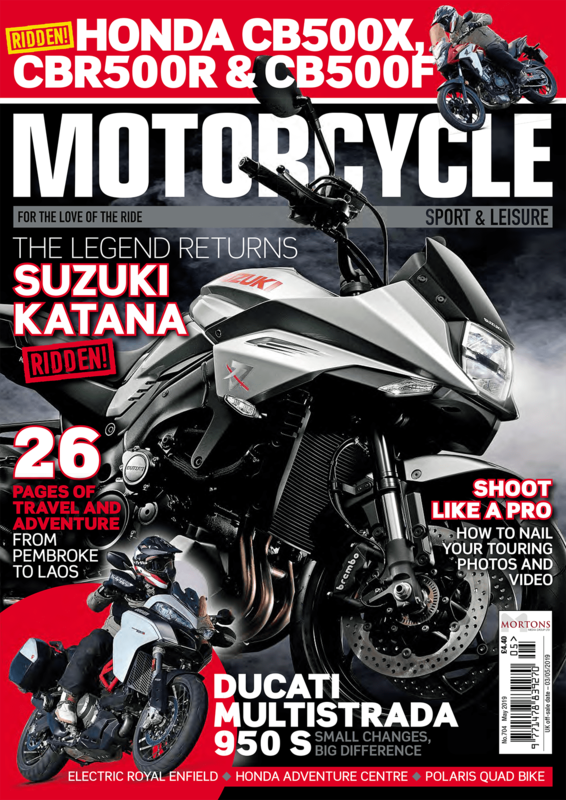 It means you struggle to see the next rider, let alone any rocks, roaming animals or corners in the road. ran through a deserted establishment. It was eerie to walk around the churches (one for blacks, the other for whites), and see the old cattle pens for this outpost that must have once upon a time been buzzing. But time had forgotten this part of the vast Karoo, which was miles from any form of settlement and was uncertainly destined to deteriorate gracelessly over time. Despite one of the riders picking up a puncture, the rest of the trail went by simply enough and eventually brought us back to a tarmac road. From there it was only a short distance to our overnight, remote stopover; a theatrical hotel. Apparently there are only three hotels like it in the world, which saw us witness a unique cabaret act over a four course dinner. Let’s just say it was a memorable evening, but unlike the day’s riding, for all the wrong reasons.